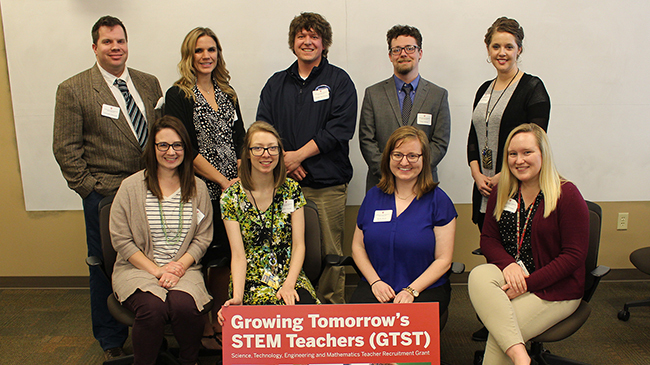 Candidates in the new Growing Tomorrow’s STEM Teachers program at the recent launch event. Standing, l-r: George Stackhouse, Alexandria Lilly, Matt Nelson, Christopher Reynolds, Tuesday Guernsey; seated, l-r: Kacee Hussung, Brittany Goode, Kelly Book, Brooke Stewart. (NEW ALBANY, Ind. )—It was smiles all around at the official kickoff reception for IU Southeast’s Growing Tomorrow’s STEM Teachers (GTST) project, at the Graduate Center in Jeffersonville, Ind. The event brought together the ten selected grant recipients, School of Education faculty, representatives of local school corporations, and community and business partners—key players in what is expected to become an impactful pillar of teacher education at IU Southeast. With the goal of increasing the number and quality of STEM educators in local Indiana schools, the GTST project is funded by a $240,000 grant from the Indiana Commission for Higher Education (ICHE). The IU Southeast School of Education was the only teacher education school in the IU system to receive the grant. “The ICHE grant is one more recognition that IU Southeast has staked out a leadership role in STEM education,” said Uric Dufrene, executive vice chancellor for academic affairs, in his opening remarks. That leadership role will become important in the years to come, according to Dufrene, who cited the “Hoosier Hot 50” job rankings to illustrate the centrality of STEM education to the region’s economic development. STEM-related jobs occupy 12 of the top 25 positions, and teaching comes in at number two. Background research by the School of Education revealed that area students are already trying to get a jump on these trends: 875 mathematics students, 725 technology students and 900 science students plan to take dual-credit courses this year from our local school corporations, according to Doyin Coker-Kolo, dean of the School of Education. As a result, there is a growing need for highly effective and qualified pre-service and in-service STEM teachers in local Indiana school corporations. It is this need that the ICHE grant is designed to address. They will get it by acquiring an initial teaching license in secondary education STEM areas through an Indiana-approved, three-semester, Advance to Teaching (A2T) licensure pathway. Additionally, GTST updates current and develops future dual credit STEM high school teachers to meet Indiana’s new requirement of 18 credit hours in graduate-level content courses. GTST is a collaborative and innovative project engaging both PK-12 and business partners in its implementation. Already involved are school corporations of Greater Clark County Schools, Lanesville Community School Corporation, New Albany-Floyd County Consolidated School Corporation, South Harrison Community School Corporation and West Clark Community Schools with business and community partners including Amatrol, Floyd County Soil & Water Conservation, Johnson & Johnson, Maker 13, and SAMTEC. The successful grant proposal was the work of IU Southeast faculty directly involved in the project, many of whom were in attendance at the launch, including Dean Coker-Kolo, Drs. Sumreen Asim, Faye Camahalan, James Hollenbeck, Gary Pinkston, Sridhar Ramachandran, and Alan Zollman. For Zollman, the GTST project has a deep personal relevance. Growing up on a farm in Southern Indiana, he became the first member of his family to attend and graduate from college, due to the teachers who believed in him and helped him recognize and achieve his potential. George Stackhouse, who teaches science at Scribner Middle School, struck a personal note in recounting his own journey in education. He recalled putting off career advancement for a variety of personal reasons such as parenthood, always waiting for the “right time” to pursue graduate studies. With the GTST program, that time is now. “As a selected candidate I can say this grant offers tremendous benefits for all the candidates,” Stackhouse said. Each candidate will receive a scholarship for up to 12 graduate credit hours, a stipend of $120 per day for three days of professional development in the summer, up to $500 for mileage/dependent care/books, up to an additional $500 for classroom materials for an Action Research Mini-Grant, up to $100 for registration and travel to a state conference, and one day of professional development during the school year. The GTST project also will provide 3 days of summer STEM professional development, for all the teachers in the school district. The candidates agree to continue teaching in Indiana for a minimum of four years. IU Southeast alumna Tuesday Guernsey teaches biology, environmental science and AP environmental science at Henryville High School in Henryville, Ind. While she enjoys a positive rapport with her students that allows her to engage them in science in fun and creative ways, she believes the GTST project can expand her range as an instructor, and ultimately deliver a more challenging and beneficial classroom experience. For Guernsey and her fellow candidates, the next two years promise to be both challenging and rewarding as they balance the demands of graduate school with full-time classroom positions. All are motivated by the desire to grow personally so that they can better serve their students. For Zollman, the goal of the project isn’t merely to produce more or better teachers, but to nurture a generation of instructors who can think outside the traditional confines of the disciplines, and initiate new paths in interdisciplinary education. “I want you to be the leaders,” Zollman said. Homepage photo: Candidates in the new Growing Tomorrow’s STEM Teachers program at the recent launch event. Standing, l-r: George Stackhouse, Alexandria Lilly, Matt Nelson, Christopher Reynolds, Tuesday Guernsey; seated, l-r: Kacee Hussung, Brittany Goode, Kelly Book, Brooke Stewart.